Information about draft horses, heavy horse backgrounds, history of the cold blooded workhorse breeds, equestrian disciplines and horse care tips. The Clydesdale is one of the most popular heavy horses in the world! Clydesdales is the quintessential embodiment of the familiar draft horse. They are beautiful movers with a high stepping gait, which made them popular as flashy carriage horses. Today they are popular in the show ring and as fancy carriage horses. The most well-known Clydesdales are the Anheuser-Busch Clydesdales. The Clydesdale is known as a Draft Horse or Heavy horse. The Draft horse is also known as the Draught Horse or Dray Horse. 'Dray' is a word derived from the Anglo-Saxon term for 'to haul' or 'to draw'. Draft horses are large and hardy, much heavier and broader than the light horses. The breeds in this horse class are referred to as cold blood breeds, in reference to their quiet and calm temperament. 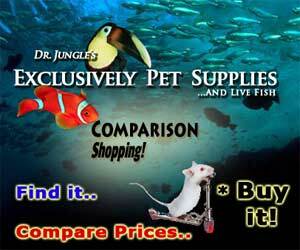 They are heavy in the body and strong legged. Many of the draft horses have the characteristic "feather", or long hair, covering their large hooves. The Clydesdale is thought to have originated in the Clyde Valley in Lanarkshire, Scotland with the mixing of local mares with Flemish stallions in the mid 1700's. The breed was founded by the 6th Duke of Hamilton and the breeder John Paterson, who intended the breed for pulling carts for the nearby coal mines. The horses were bred to have large, well-proportioned feet and sound legs for walking on hard, cobblestone roads. The have longer legs than other draft breeds and having "cow hocks" is an acceptable breed standard that allows their large feet to fit into the furrows for plowing. They were first shown to the rest of the world at a world’s fair called the Glasgow Exhibition in 1826, and began being exported to do farm work in other countries. By the 1930’s, farm horses were replaced by tractors and automobiles put carriage horses out of work, causing the Clydesdale population to decline. The breed was in danger of dying out, but in the 1960’s, Clydesdales became popular in the show ring and as fancy carriage horses. They are currently one of the most popular heavy horses in the world. The modern Clydesdale stands at 16.2-18 hands high and has a straight facial profile and long legs with long, silky hair called "feather." They have longer legs and more streamlined bodies than most draft breeds. When walking behind them and the legs are straight is said to be 'close behind'. It where they place one huge back hoof exactly in front of the other as if they were walking along a single ploughed furrow. 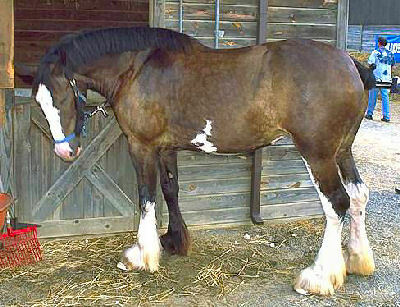 Cow hocks are considered a feature of the Clydesdale breed, although it is often seen as poor conformation in horses. The "cow hock" is a condition where the tarsal joint of the hind leg is set inward resulting in a splayed look, or a "knock knee" appearance. The Clydesdales are large horses. They eat about twice as much as other horses, which is about 25 to 50 pounds of hay a day, plus about 5 pounds of concentrated feed if they are being exercised. Since Clydesdales are large horses, they need more room than other horses. A 24' x 24' stall is the minimum size a Clydesdale should be kept in as long as they are turned out into a paddock daily. The Clydesdale has a very pleasing disposition. It is proud, alert, intelligent and willing. They are commonly used for pulling carts or carriages. In the show ring, Clydesdales are shown in halter, cart, and hitch classes. They also make good riding horses and people use them for trail riding, jumping, and dressage. Their calm personalities make them a good horse for therapeutic riding programs that help disabled people learn to walk by feeling the movements of the horse's walking. "Scratches" or pododermititis are more prevalent in horses that are subjected to wet muddy conditions for extended periods. Horses with white feet seem also to be more susceptible to scratches. The Clydesdale is available many parts of the world and are fairly inexpensive. This did not answer my question, but it did have good information. I just like answering the math problem to submit the comment! Our Clydesdale has growths under her feathers about 4 inches up from backside of all four of her hooves. They look like duclaws or very weird growing nails. Any idea what this is? I have been told by my farrier that these are perfectly normal, and when you get your horses feet trimmed next ask the farrier to cut them off. I have to admit I was a bit freaked out when I saw them for the first time. What Loran is saying is correct.Our Clydesdales have them too,and the farrier cuts them off from time to time. All horses have these; they're just much bigger in heavy draughts. They're called ergots and are remnants of a 'toe' from the 3-toed ancestor of the equus calibus. Remnants of the other toe are now the chestnuts near the knees/hocks. Clydesdale needed. Must be muscular and strong. Appx. age- 15 yrs. Using for hauling loads up to 230 lbs. Thanks!